Usually when I grow carrots they are very sweet; so sweet that they get eaten raw, I don’t get to cook with them. Not so this year. I am not sure why, but they had a little bitterness to them, even the little ones. So, time to roast them and bring out their natural sugars. So they got to serve double duty, first the greens went into Carrot Top Pesto, and now the roots filled out our meal with Swiss Chard Fritters from Yotam Ottolenghi’s Jerusalem. Yes, it was a light dinner, but quite satisfying, especially when dessert was Arielle’s zucchini bread! The roasted carrots are simple, yet very tasty. They would also be good with a splash of balsamic vinaigrette with the olive oil. Clean the carrots well. Leave them whole, preferably with a bit of the top still on. Toss the carrots with the oil and salt. Spread out on a baking sheet. Roast for 15 – 20 minutes, until the carrots are cooked through at their thickest ends. Serves 4 as a side dish, served 2 of us in this light meal. Remember when hot pockets were new? Boy did I think they were cool. So handy, and back then I even thought they were tasty. OK, that was before I discovered fresh, non-processed foods. But I still think they are a neat concept. So I was tickled when I found a recipe for broccoli cheddar pockets where I could use broccoli and chives from my garden. The recipe is from Food Network Magazine. I adapted it a bit by substituting greek yogurt for sour cream and forming individual pockets rather than cooking all four pockets as one large pocket. And when it is so quick and easy to make this, there is almost no reason to go the pre-processed route. I was out in my garden picking my purple beans when I looked down and saw a very large black snake trapped in the bean netting. At least I didn’t scream. It wasn’t moving, so I assumed it was dead; I would deal with it later. An hour or so later, I was back in the garden to weed. When I hoed near the netting, the snake moved. Holy ____! The snake was alive! I knew that if I did not do anything it would die; I couldn’t have that on my conscience. But I am pretty scared of snakes and this guy was big – about 9 feet or bigger and about 2 inches in diameter. I got some clippers and started from the tail end. At first I could clip and not touch the snake, I stayed as far back as I could. But I realized that to actually release him I would need to hold his body still so I could work the clippers between his body and the netting, which was pretty snugly against him. It took a lot of willpower to get myself to grab him, and grab him strongly. The process of cutting him out took 20 minutes – he had wrapped himself in there pretty completely. Of course, as soon as I got him released he headed right back towards the netting – oh no! I quickly grabbed him and tossed him to the edge of the garden. But he could not find a way out. I feared that if I left him there he would end up back in the netting. Once again, I grabbed him and then I flung him out of the garden! He crawled away quickly to the safety of the darkness under my shed. My adrenaline was flowing and my heart continued to pound for about 10 minutes. But I was pretty pleased with my good deed for the day. 1 3/4 cups grated sharp cheddar cheese, about 5 oz. Bring a saucepan of lightly salted water to a boil. Add the broccoli and cook 1 minute. Drain and rinse under cold water until cool. Pat dry. Preheat the oven to 425F and spray a baking sheet lightly with vegetable oil spray. Mix the broccoli, cheddar, yogurt and chives in a bowl until combined. Squeeze the mixture together with your hands to make it compact. On a floured surface, roll out the dough. Cut into 4 equal pieces. Place 1/4 of the broccoli mixture in the center of each piece of dough. Fold each into a pocket. I Folded each corner in and pinched the seams closed. Place seam-side down on the baking sheet. Beat the egg with 1 Tbsp of water and brush the pockets with the egg wash. It is that time again…Swiss chard bouquets are adorning my counter top. Such a happy thing, they always make me smile. There is a lot of swiss shard growing in the garden. I thought I had a lot last year, but I think this year there will be more. So I need to even more uses for it. Any suggestions are welcome. Before I talk about the vegetable gumbo, I want to give a shout out to Yotam Ott0lenghi for another great dish in Jerusalem – Swiss Chard & Wheat Berries with Pomegranate Molasses. This was as tasty as all his dishes have been, with such a beautiful rich color…and so easy to make! Back to the gumbo – I found this recipe for vegetable gumbo in Food Network Magazine. It is really simple, hearty and tasty. I suggest serving it over rice with hot sauce available on the table. Heat the vegetable oil in a large pot over medium-high heat. Add the flour and cook, stirring until golden, about 3 minutes. Add the onion, bell pepper, celery, garlic, 3 Tbsp water and 1/4 tsp each salt and pepper. Reduce the heat to medium, cover and cook, stirring occasionally, until the vegetables soften, about 8 minutes. Add the Worcestershire and paprika and cook, stirring, 30 seconds. Stir in the broth, scraping up any browned bits from the bottom of the pot, then cover and bring to a boil. Add the greens and black-eyed peas to the pot. Reduce the heat, cover and simmer, stirring occasionally, until tender, about 15 minutes. Season with salt and pepper. It always seemed such a waste to me to discard (compost) the carrot greens after harvesting my carrots. There had to be a use for them, I just didn’t know what. Time to turn to my favorite book about root vegetables, Roots by Diane Morgan. And there it was, a recipe for Carrot Top Pesto! It seemed like the perfect combination, my love of pesto and my disdain for wasting anything I grow. I just had to try it. Plus, it gave me the opportunity to have carrot bouquets on my counter! How did it turn out? Let’s just say that Cam had a double helping! Carrot top pesto will become the standard dinner on carrot harvest days. It tasted very much like basil pesto, but with carrot overtones and a nice, sharp bite. My note – Toasting pine nuts – Heat a small non-stick skillet over high heat. Toss the pine nuts in the dry skillet and keep stirring/swirling for about 1 to 1.5 minutes. Remove from heat. Be careful not to burn the pine nuts. In a food processor, combine the carrot leaves, garlic, salt, pepper and cheese. Process until finely minced. Add in the oil and process until just combined. Use immediately or refrigerate for up to 2 days. Enjoy! 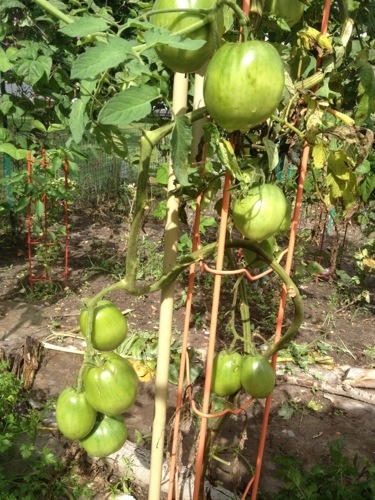 This was the first year I grew kohlrabi. I think I let them grow for too long, 3 of them split (I couldn’t use those) and the others were a little tough. That said, they still tasted really good cooked, all I needed to do was cook them a little longer. Next year I will harvest them earlier. With the kohlrabi being a little tougher, I decided either roasting or stir fry would be the best approach. I opted for stir fry because it is just too hot to have the oven on for roasting. The stir frying worked well, the texture of the final kohlrabi was perfect. I also used the broccoli from my second harvest. They were three mini heads, the equivalent on one small head. To serve it, I made some organic short-grained brown rice. The heartiness of the rice helped make this a satisfying dish for dinner. 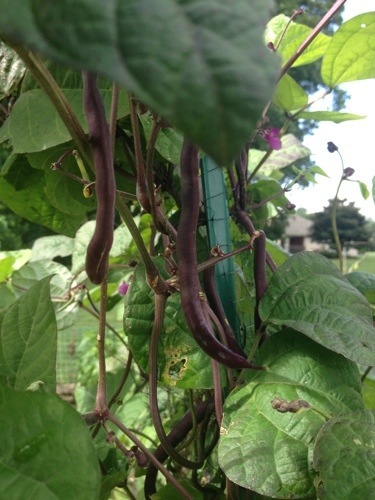 and the purple string beans are producing profusely. Parts of the garden are not so happy though, there has been too much rain. The zucchini plants are gone and the swiss chard is droopy – they look soggy. 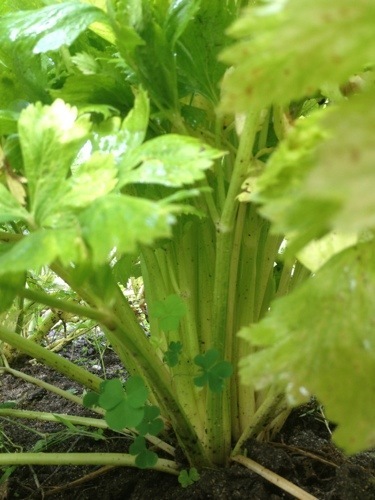 I also think it has been too wet for the celery, they are still ok, but I will need to harvest them soon. Prepare the sauce. Mix together all the sauce ingredients. Taste and adjust salt, soy or ginger to taste. Heat the oil in a wok over high heat. When it begins to smoke, add the kohlrabi, carrots and broccoli. Stir fry for about 3 – 5 minutes, until the vegetables are just tender. Add the scallions and stir fry another minute. Add the sauce and toss. Serve over rice, sprinkle with sesame seeds. Enjoy! I promised that I would include the good, the bad and the ugly….well, let’s call this one a “good start”. I like to use as many parts of each plant as I can. So when I learned you can eat the leaves of the kohlrabi, I was pretty excited. I started searching for recipes. I was thinking a saute, similar to what I do for kale, would be good. But they seemed a bit tougher, more like collard greens, so maybe they needed some boiling first. I found a recipe for kohlrabi greens with toasted sesame oil and soy sauce from the Ivy Manning collection on Culinate, Inc. Sounded good so I tried it, and it turned out to be pretty good. Step 1. Cut the leafy part of the greens from the stems. Step 2. Cook them in boiling water for 1 – 3 minutes until they are tender (mine took 3 minutes). Drain and squeeze out the extra pater with a spatula. I think they are quite pretty. Step 3. Toss with a little (1 tsp) sesame oil and soy sauce to taste. Sprinkle with sesame seeds. Enjoy! This time they were a side dish with skillet hash browns and eggs. They went very well with the eggs, that may be a combo worth building on. Arielle came home from Farmer Kim with some fresh yukon gold potatoes and eggs. 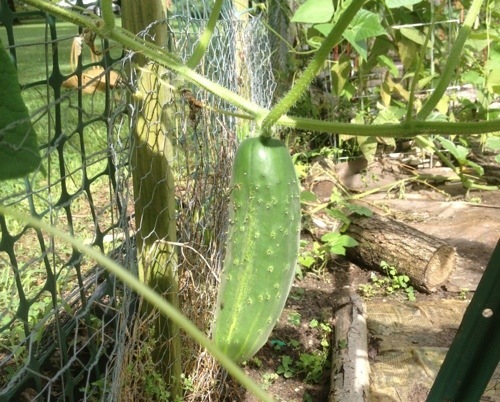 + I went to the garden and harvested a zucchini. + I stopped by Beechwood Orchards’ stand at the farmers market and bought some garlic scapes. + some parmesan, kosher salt and pepper. = You have the makings for a very tasty frittata. The key to making this frittata special (aside from the very fresh ingredients) is to slice the potatoes thins and cook them until they are starting to get crispy before adding the other vegetables or eggs. That way, they maintain a nice crispiness in the finished frittata. This frittata is more vegetables than eggs, the eggs are basically there to bind the vegetables. Covering the pan helps puff the eggs and makes it seem like there are more eggs than there actually are. I make my frittata with just 4 eggs, but 5 would would well also. As I usually do, I put sriracha on the table in case we wanted to spice up the dish. But neither of us touched the hot sauce, the frittata had such nice flavor in itself. Yum! I woke up at 4:30 am. Ate my bagel and 1/2 banana and was out the door by 5:15, after coming back in for bug spray to guard me from the nasty mosquitos. It was already hot and extremely humid; I was in a full sweat before the first mile was completed. Ugh! The run, Part B, started off well for another mile. Then the sun rose above the trees and there was no more shade. The chills came back and my legs feel like lead. I fiddled with my timing beeper and screwed it up, it was no longer useful. The negtive-speak came back and won out this time. I used up all my water and ended up walking at some point after 8.5 miles. I was ready to walk all the way home, feeling defeated. As I passed the State Fire School I noticed there were people there…I could get some water!! They even had ice! I walked a little farther then ran the final mile home, feeling a little refreshed and much better about my effort. I realized I had no back or shoulder pain, so I must at least be using good form and I didn’t let that slip. An hour and a half after I was done, I was one my way to take my son to his gymnastics class, feeling fine, not achy at all, enjoying my post-run coffee. I ended up averaging 11’36″/mi with all the walking. Next up, Rock N’ Roll Chicago Half Marathon! Preheat the broiler to 550F. In a large non-stick skillet, heat the olive oil over high heat. Add the potato slices, reduce the heat to medium-high and cook 3 – 4 minutes, stirring occasionally. Add the garlic scape and zucchini, cook another 3 – 4 minutes, stirring occasionally. Season with salt and pepper. Reduce the heat to medium low. Add the beaten eggs, swirling around to distribute them around the vegetables. Cook for 1 minute and sprinkle the parmesan over all. Uncover and place in the broiler to lightly brown the top of the frittata. 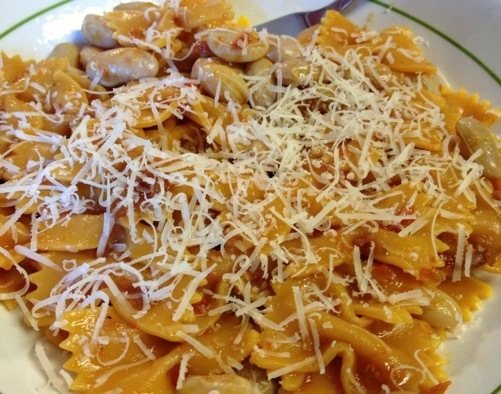 Serve with some extra parmesan and enjoy! I picked up fresh cranberry beans at the farm market the other day. I didn’t know what they were, but they were so pretty, I couldn’t resist them. So then it was time to do some internet research. 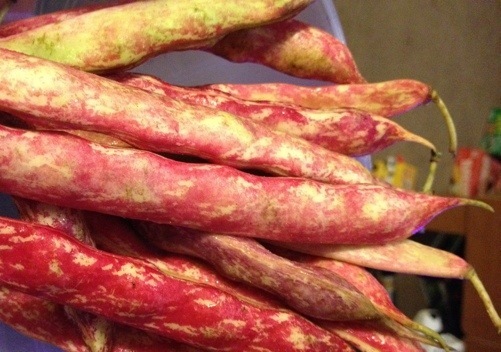 Cranberry beans are also called Berlotti beans. 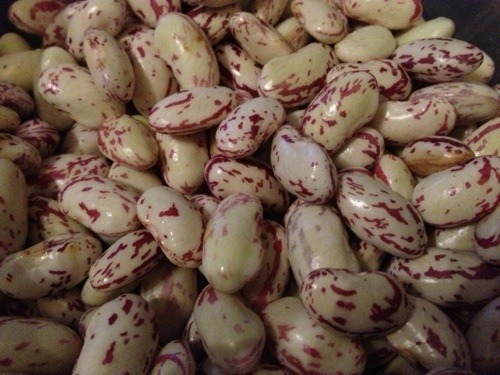 They are beautiful beans, white with red dots and stripes. But sadly, the beans lose that beautiful color when they are cooked. 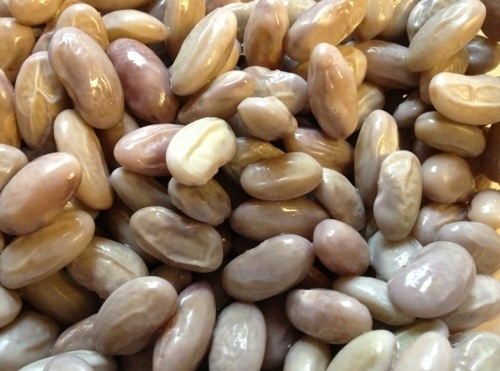 They are used similarly to canellini beans or lima beans. So, I figured that some sort of mixture of the beans and flavorful tomatoes would work well and be very healthy to boot. Cranberry beans are very high in protein, iron and dietary fiber. Pasta sauce seemed a good option. Bring a pot of salted water to boil. Cook pasta according to package directions. Drain. Meanwhile, place the beans in a medium saucepan with water and about 1 tsp salt. Bring to a boil and cook for about 10 – 12 minutes, until the beans are just tender. Drain. Heat the tomato confit and beans in a skillet. Bring to a boil, them cook, covered, over low heat for 10 minutes. 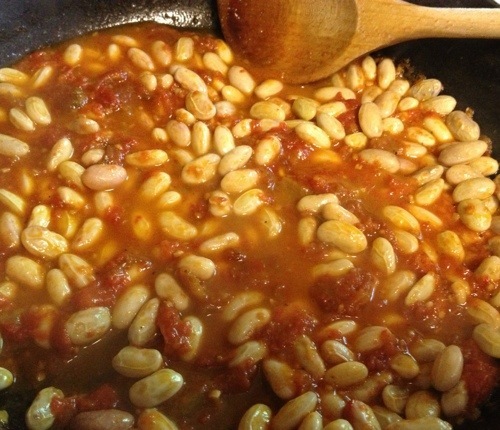 Toss the pasta with beans and tomatoes until well mixed. Served with freshly grated parmesan. Enjoy! Nothing says summer like watermelon. You may not know this, but Delaware is a big watermelon growing state. 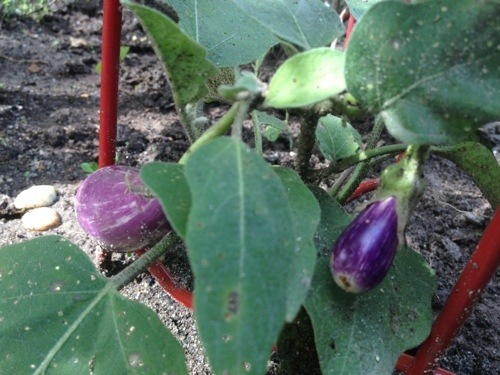 With our locations on the DelMarVa peninsula (Delaware-Maryland-Virginia), we have nice sandy soils and hot summers with just the right amount and timing of rain for sweet watermelons. As we say here, they are “delmarvalous!” Tacky, but catchy. And nothing says, “we are in for happy food” like salsa. I may eat mexican food in the winter, but when I think salsa, I think summer. Salsa made with ingredients fresh from my garden, mmm. Put salsa and watermelon together and you get a perfect summer food – watermelon salsa! Sweet and hot and ultimately refreshing. Cam is learning to swim this summer, so we spend a lot of time at the pool. That means eating a quick lunch at home before heading to the pool. One of my favorite quick lunches is nachos. Eating simple cheese nachos topped with watermelon salsa is a great way to fuel up before an afternoon in the pool. Stir together the lime zest, juice, sugar and pepper in a bowl. Add the rest of the ingredients, except the salt. Toss until well mixed. Chill. Add salt when ready to serve. Serve with tortilla chips or with nachos.